This article is about the 1917 film. For other uses, see Poor Little Rich Girl. 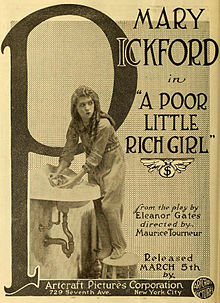 The Poor Little Rich Girl is a 1917 American comedy-drama film directed by Maurice Tourneur. Adapted by Frances Marion from the 1913 play by Eleanor Gates. The Broadway play actually starred future screen actress Viola Dana. The film stars Mary Pickford, Madlaine Traverse, Charles Wellesley, Gladys Fairbanks (returning from the play) and Frank McGlynn Sr. The film was shot in Fort Lee, New Jersey when early film studios in America's first motion picture industry were based there at the beginning of the 20th century. 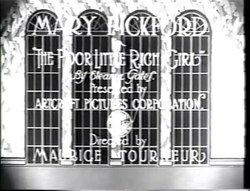 In 1991, The Poor Little Rich Girl was deemed "culturally, historically, or aesthetically significant" by the United States Library of Congress and selected for preservation in the National Film Registry. Gwendolyn is an 11-year-old girl who is left by her rich and busy parents to the care of unsympathetic domestic workers at the family's mansion. Her mother is only interested in her social life and her father has serious financial problems and is even contemplating suicide. When she manages to have some good time with an organ-grinder or a plumber, or have a mud-fight with street boys, she is rapidly brought back on the right track. One day she becomes sick because the maid has given her an extra dose of sleeping medicine to be able to go out. She then becomes delirious and starts seeing an imaginary world inspired by people and things around her; the Garden of Lonely Children in the Tell-Tale forest. Her conditions worsens and Death tries to lure her to eternal rest. But Life also appears to her and finally wins. ^ Review, synopsis and link to watch the film "A cinema history". 1917. Retrieved 6 June 2014.